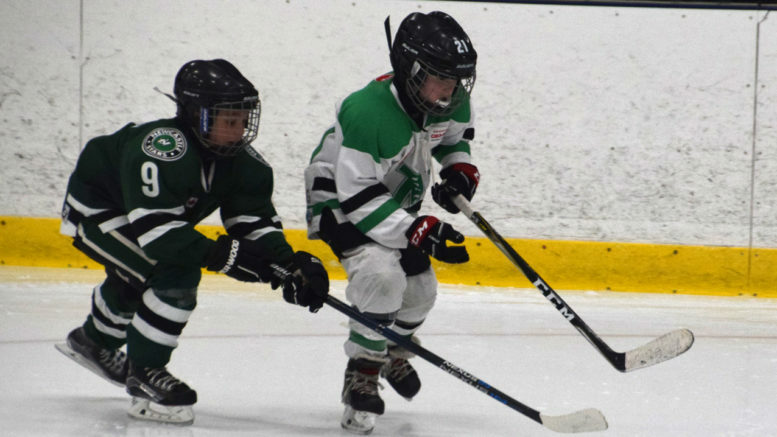 Keagan York (right) of the Novice AFW Construction BB Stars carries the puck into the offensive zone during Saturday’s playoff game against Newcastle. Photo by Adam Prudhomme. The Napanee Peewee BBs are moving on to face St. Mary’s in the OMHA Finals after dispatching Collingwood. They will face St. Mary’s which is a centre north-east of London. The Stars have home ice advantage with games in Napanee Saturday at 7 p.m and Sunday at 1 p.m. The locals stack up well having a 22-0-0 regular season record compared to the St. Mary’s Rock’s 19-0-1. In the playoffs, the Stars are 10-0-1 while the Rock are 9-3-0. Goals for and goals against in the playoffs are 93-13 for Napanee; 44-26 for St. Mary’s. They’ll look to make the most of their home ice advantage this week and build an early lead before they hit the road. – The Novice AFW Construction BB Stars lost 4-2 on Sunday in Newcastle in their fifth game in the series to end their playoff run. They fell behind early on before Ben Kerr scored to make it 2-1. Wyatt Whalen contributed the other, and they removed the goalie for an extra attacker, but to no avail. On Saturday, their guests built a three goal lead before Colton Lockridge scored on a rebound that Camden Arthur had sent toward the net. Their guests added two more to make it 5-1 for Newcastle. The shots on goal were 16-11 for their opponents. Combined with an earlier 4-2 loss and a 2-2 tie meant that Sunday’s game was a must for Napanee. – The Atom BB Stars, after an incredible year, finally were eliminated from further play in the OMHA semifinals by another excellent team, the Midland Centennials (54-3-2). The locals were edged 2-1 on Saturday on the road with Dylan Kemp contributing the only goal for the Stars. Friday night in Midland, the squad lost 3-1. The Napanee team had a season record of 27-3-2, with 13 straight wins to start out their regular season. Up to this point, they are the only playoff team to gain a win over the Centennials. – The Joyce’s Meats & Deli Atom AE’s dominated Centre Hastings 10-1 in an exhibition game last Sunday. Goal scorers were Scott Scrimshaw (three), Drew Osborne (two), Evan Godfrey (two), Ben Szuch, Wyatt Albright, and Sam McCaw.